With time ticking away in the extra-time frame of the Netherlands versus Costa Rica affair on Saturday evening at the Arena Fonte Nova in Salvador, Brazil, and neither team able to break the deadlock, one of the sideline cameramen had his attention on something very unusual. It was Dutch backup keeper Tim Krul with one of the Dutch coaches, warming up on the sidelines. The 26 year old goalkeeper who had spent his last 8 years with Newcastle United in the English Premier League, did not play a single minute in any of the Netherlands’ four previous matches in this year’s World Cup. With Krul being about two inches taller and having a wider reach to that of the starting Dutch keeper Cillessen I knew exactly what was about to happen if this match was to go to a penalty-shootout. And although I understood the situation completely, I was still in disbelief, as this had never happened previously at a World Cup tournament. Louis van Gaal was using up his last substitution of the match to swap goalkeepers, in hopes that Krul could be the Dutch savior on the day. 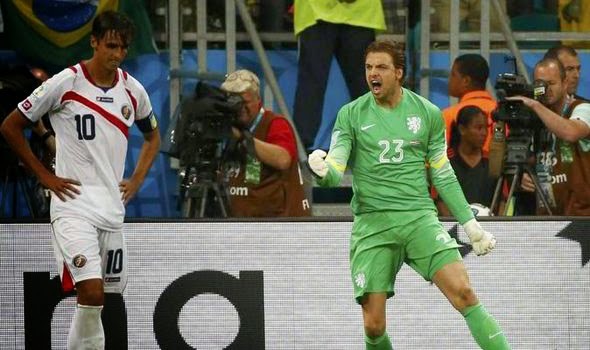 With 120 minutes and 50 seconds on the playing clock, Tim Krul entered the match. About 46 seconds later the referee had blown his whistle, indicating penalty-kicks, and joy for Los Ticos who hung on for the draw against the mighty Dutch. All eyes were on Costa Rican goalkeeper Keylor Navas who had been one of the bright spots of the tournament, conceding just twice in four matches and saving a crucial penalty-kick against the Greeks to set-up this very meeting against Holland. But on this day, an unlikely hero would emerge. A hero who’s official World Cup playing time was less than a single minute. 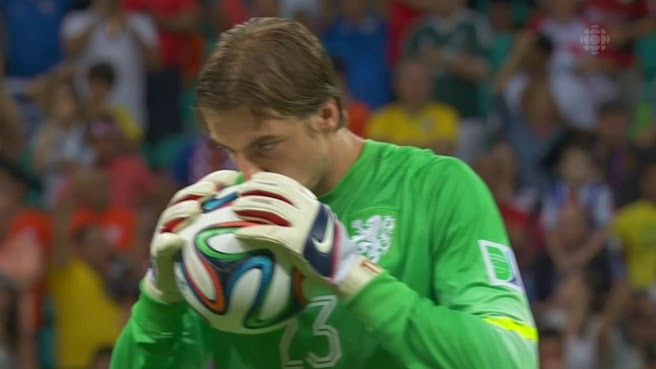 Kissing the match-ball, Krul made his way to the goal looking calm and collected, with the weight of his nations on his shoulders. A quick handshake with the opposition goalkeeper Navas, Krul turned his attention to the first Costa Rican kicker Celso Borges, pointing to his own eye, indicating that he knows where the kicker is going to place the ball. Just before the first spot-kick, the 6ft4in keeper rattled the crossbar without much of an effort to jump up, oozing confidence, playing mind games with the Costa Rican kicker. On the very first shot he faced, Krul guessed correctly to his left, but the ball went just past him giving Costa Rica the advantage. Tim Krul got up and kicked the goalpost in frustration. With his teammate Robin van Persie scoring on his attempt, Krul was now facing Costa Rica’s captain and Dutch league player Bryan Ruiz. With a cheeky fist-bump, as if to wish the kicker good luck, Krul took his place between the posts. Guessing correctly to his left once more, Krul made the save. He jumped up quickly, celebrating with his fist up-high, knowing that he was doing exactly what was asked of him. The Dutch scored again, with Robben sending the Costa Rican keeper the wrong way. Next up for Los Ticos was Giancarlo González. Before González was able to place the ball on the white spot Krul approached him, motioning to him that he will not be able to score, then pointing to himself in an “I got it” type of fashion. Krul guessed correctly once more, again going to his left with the ball however flying into the net just above his arms. With González celebrating, Krul kept up his mind games, pointing to his eye telling the Costa Rican that he knew exactly where that ball was going even though he was just shy of putting his palm on it. The Dutch scored again, when Wesley Sneijder placed his shot perfectly behind the Costa Rican keeper. Just before Costa Rica’s fourth shot, Krul had a few more words towards the opposition player Christian Bolaños, and again the Dutch keeper guessed correctly, this time going to his right. 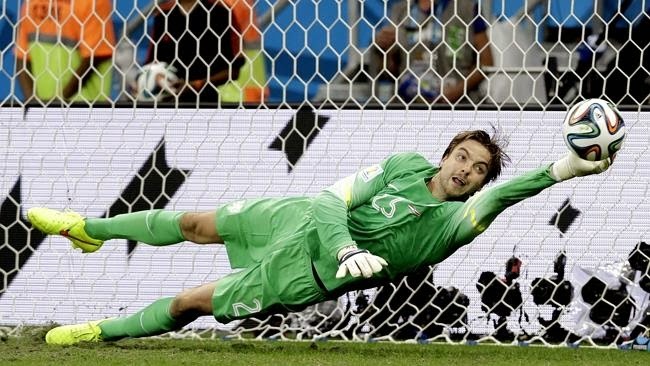 Krul’s fingers were inches from the ball, but it went in, giving the Costa Ricans a lifeline. Dirk Kuyt scored for the Dutch, setting up what could be a game-winning save from Tim Krul. Defender Michael Umaña stepped up to the spot with Krul just casually wandering around the edge of the 6 yard box, not even looking at the Costa Rican. With a few last second shouts and again rattling the crossbar, clapping his hands, intimidating the opponent, Krul guessed correctly for the fifth straight time, going to his left again, palming Umaña’s kick away from goal, giving his nation the glory of a semi-final meeting with Argentina. With the Dutch players swarming the last minute substitute, it was obvious that there was only one hero on the day. 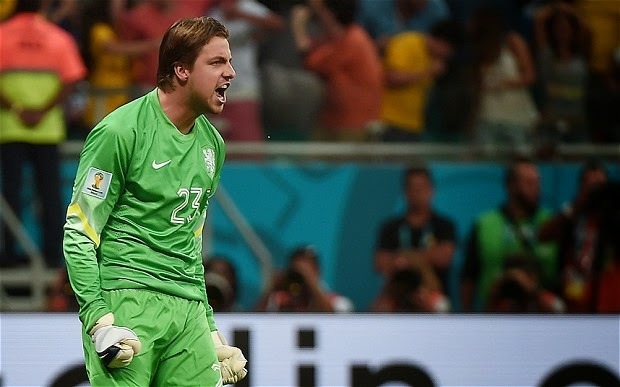 It was Tim Krul, who played just 46 seconds, not touching the ball even once during regular play, becoming a World Cup sensation and the idol of a whole European nation in an instant.